Users can view locations of fires on peat lands, which has become imperative due to environmental and health implications, including haze and smoke that result from burning on high carbon soils. 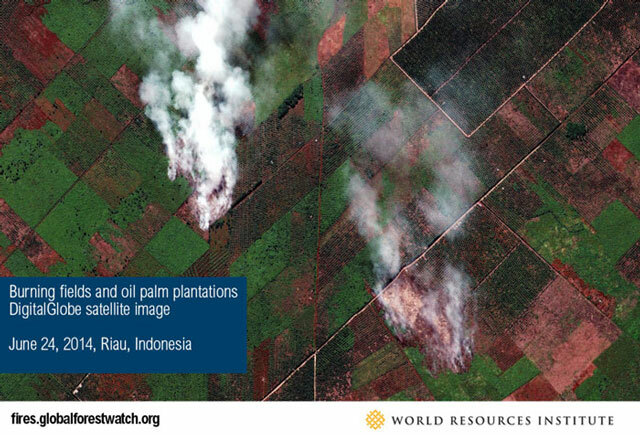 FORESTS News reports that, “Peat fires were the largest single source of greenhouse gas emissions in 2005 (larger than energy).” What makes this application truly exceptional, is the addition of DigitalGlobe’s remarkable 50 centimeter resolution satellite imagery, giving a bird’s eye view sharp enough to see each tree on the ground. With the help of NASA’s MODIS data and imagery, used to locate the fires, DigitalGlobe can now be directed to a location to take super high resolution images. This imagery is so clear that you can easily distinguish between healthy and dead vegetation, the type of vegetation effected, view and draw burn area boundaries, and detect previously existing burn scars. This allows accountability to be assigned to the fires, as one now has the tools to investigate where and how these fires have started. What was once a point on a map can now be confirmed through close to real-time imagery. In addition, the user can then view wind direction and air quality data, key components of determining who will be effected downwind. Often, a fire may be located in Indonesia, but the toxic air is carried to a neighboring island in Malaysia or Singapore. By utilizing the ArcGIS Image Extension for Server, the platform computes and provides statistics on a selected area of interest, and allows the user to export the analysis in a report. In order to get this information to the public, GFW-Fires also offers an SMS Alerts system, using the Twilio platform. The addition of this capability has made it possible for Global Forest Watch to achieve their goals of responding to environmental hazards faster than ever before. It is now possible to locate a fire, confirm and analyze the fire, and get the word out through SMS Alerts in a matter of minutes. 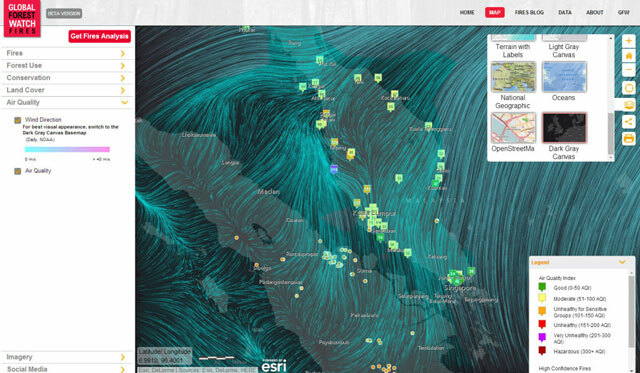 Using the extensive amount of data available on the platform, users have the capacity to voice their concern and request change towards a sustainable future free of dangerous smog and land conflict. 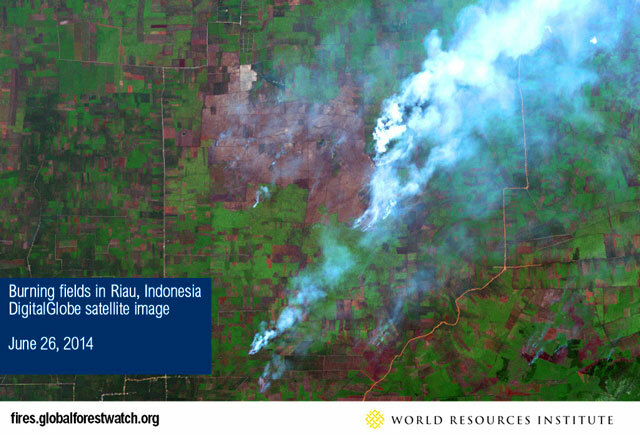 Read more by the World Resources Institutes’ blog series on Indonesia Forest Fires.